Our company is the Top PhoneGap Application Development Company in India and also the Leading PhoneGap Application Developers in Madurai. The clear advantage of choosing our PhoneGap Application Development Company in India is we provide access to all the native mobile devise apps. This application is used to deliver a great product on time. It is easy to start with default and provides options for deep customization. It plays nice with all the development tools, libraries, and frameworks. This tools used for verification of phone number of developers. It is an e-payment method and it is most popular in the world. It does not require any technical skill. This app is perfect for your business. This application creates HTML5 apps with a programming language. Advanced users and programmers get benefits from app builder. Built for operating systems and devices. Must approve by the app market. Not dependent on a container. No approval is needed from an app store. Web Hybrid mobile app- it is wrapped with a thin native container. It is basically a wrapper for webview communication. Native hybrid mobile app- it provides multiple webviews with the access of device. (ii) Runs as a locally installed app on any device. (v) Runs with multiple screen sizes. (vi) Submission, approval, and distribution by an app marketplace (iOS App Store, Google Play) is a must. We provide solutions in the domain of cross-platform. 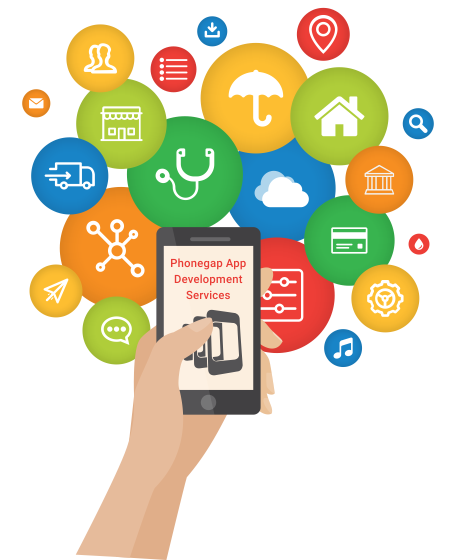 Hire PhoneGap Apps Developers, our developers are always happy to help you with your business. We have experienced developers in our company. They also provide quick app development with the budget.